Are the U.S. and Russia fighting against each other in Syria? 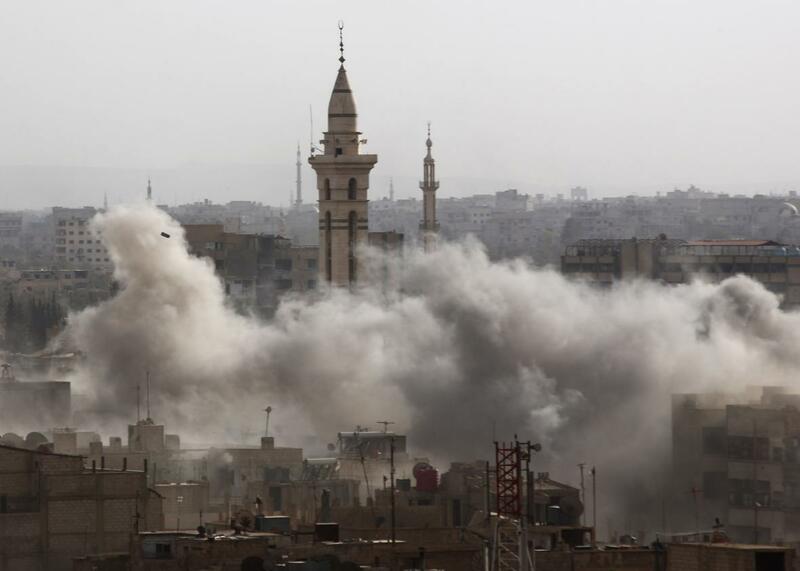 Smoke billows from the Syrian rebel-held area of Douma, east of the capital Damascus, following a reported airstrike by government forces on Sept. 16, 2015. The skies over Syria are getting very crowded. The Pentagon says that some time in the past few days, two U.S. aircraft were diverted in order to maintain safe flying distance with Russian jets. U.S. pilots are under orders to maintain a 20 nautical mile distance from any Russian plane, a limit that has been tested several times already since Russia started flying missions over the country in the past few weeks. After last month’s news that Russia would be sending troops to Syria in an effort to bolster President Bashar al-Assad’s flailing regime, it has become clearer that America’s goals in Syria and Russia’s diverge a great deal more than the two sides are willing to admit. The U.S. and Russia had held talks last months on “deconflicting” their forces in Syria, which essentially meant trying to avoid the unlikely but potentially disastrous scenario where the two sides end up fighting each other. Defense Secretary Ash Carter insists there’s no cooperation between the two, only “basic technical discussions on safety procedures for our pilots over Syria.” For now, the two countries are waging “rival, uncoordinated air campaigns” over Syria, as Reuters reports. One would hope there are enough safeguards in place to avoid a dogfight between U.S. and Russian fighters, but Russia’s involvement is undoubtedly stymieing U.S. strategy in the conflict, such as it is. Russia is also directly attacking rebel forces supported by the U.S. So are the U.S. and Russia fighting against each other in Syria or conducting parallel operations? A favorite line of critics of Barack Obama’s foreign policy is that he plays checkers while Putin plays chess. I think this gives Putin too much credit as a grand strategist: He’s more of a master improviser, adept at turning chaotic situations to his advantage but not always thinking more than a step or two ahead. But the metaphor is accurate in that the two sides are playing very different games. Russia’s intentions in getting involved in the risky conflict may have flummoxed Washington, but it’s at least clear what victory looks like for Putin: a pro-Russian government still in power in Damascus. Russia’s makes little distinction between ISIS and the other rebel groups fighting Assad. “If it looks like a terrorist, if it acts like a terrorist, if it walks like a terrorist, if it fights like a terrorist, it’s a terrorist, right?” is how Foreign Minister Sergei Lavrov put it last week. Russia, which has been alarmed by what it sees as U.S. backed coups against pro-Russian governments in Ukraine, Georgia, and elsewhere, might even view U.S.-backed rebels as more of a threat than ISIS. For the U.S., the end goal is a little less clear. It wants to “degrade and ultimately destroy” ISIS, as the president put it. Publicly, the Obama administration maintains that it supports anti-Assad rebels and wants the Syrian leader to step down, but it clearly doesn’t trust the rebels on the ground enough to give them the weaponry or air cover they would need to actually win. U.S. efforts to train its own anti-ISIS rebel force, meanwhile, have been a nonstarter. For now, the U.S. plan seems to be to focus on fighting ISIS in Iraq and supporting a Kurdish offensive against it in the chaotic east of Syria, while hoping that the situation in the west—where rebels are fighting government forces—will just work itself out. This is extremely bad news for the rebel forces in the northwest and south of the country, who have been holding out against both the government and ISIS for years and now have to contend with Russia as well. But as long as ISIS is still a threat, the U.S. and Russia can keep a wide berth and focus their efforts on different parts of the country. The official lines will be that they are not fighting with or against each other, just fighting parallel wars at the same time in the same country. If either of the two campaigns actually do start to make headway against ISIS, then the remnants of the internationally backed rebel forces could turn their full attention to Assad’s Russian-backed regime. At that point, the official line becomes a lot harder to maintain.